When people envisage how future offshore wind energy projects will be built, the topic of accommodation vessels inevitably comes to mind. Illustrations of futuristic ships have been created, showing how workers could be housed for weeks at a time far from shore in rough seas. While these visions are compelling, few people realise that accommodation vessels have been in use since 2008. The future is already here, largely thanks to three ships owned and operated by C-Bed Floating Hotels. C-Bed began with just one ship, Wind Solution, a converted roll-on, roll-off car ferry boasting 80 cabins. The vessel’s first job in 2008 was to house technicians installing turbines at near-shore UK wind farm, Lynn & Inner Dowsing. It then moved into Danish waters to support construction of Horns Rev 2. The success of these initial ventures prompted Siemens and other clients to use the vessel at Greater Gabbard, off the east coast of England. More recently, Wind Solution has been anchored at the Lincs site. In summer 2010, C-Bed brought a second, larger vessel into service, Wind Ambition. Like its predecessor, it is a converted ferry, but it features 150 cabins. In less than three years, Wind Ambition has provided a temporary home for technicians working on three UK offshore wind farms — Walney phase 1, Sheringham Shoal and London Array phase 1. An even larger ship, Wind Perfection, was introduced at the end of 2012. It immediately began work at the 400MW Danish project Anholt and is booked up into 2014. Wind Perfection is enormous compared to its sister ships, with 500 cabins. To date, C-Bed’s three ‘floating hotels’ have housed, fed and entertained hundreds of workers, who have collectively been responsible for the installation of 2.7GW of offshore capacity in UK and Danish waters. This is an impressive contribution, given that by early 2013 global offshore capacity stood at just over 5GW. Anyone with hands-on experience of managing offshore wind construction will appreciate some of the advantages of using an accommodation vessel, even for projects relatively close to shore. Spend a few days watching the time-consuming daily transfers of technicians from shore to an offshore site, and it is logical to ask whether anchoring a boat within or near a site’s boundaries might not be more efficient. Crew-transfer vessels (CTVs) are currently limited to transporting 12 technicians per journey in most situations, which means it can be time-consuming — and expensive — to transport workers to turbines from the quayside. Even for projects just a few kilometres from shore, hours of CTV use are clocked up daily during the turbine installation phase. By housing technicians much closer to the turbines they are working on, transport times and fuel mileage can be slashed, which translates into more work time and lower costs. In addition, shorter windows of good weather can be exploited if workers are just minutes away from turbines, rather than waiting onshore. Another key advantage of accommodation vessels is lower sickness and absence rates, thanks partly to C-Bed’s no-alcohol and no-drugs policy on board its vessels. If technicians are housed onshore in hotels, often far from home, how likely is it that they will spend every evening clean and sober? Overall, the strongest argument for accommodation vessels is that they increase worker productivity and keep projects moving forward more smoothly. They also offer the possibility of reining in project costs, provided the price tag for vessel rental is reasonable. "If you combine savings in onshore costs — taxis, hotels, food allowances — with savings in time and fuel from fewer CTV transfers, then accommodation vessels become an attractive option," says C-Bed technical key account manager, Martin Vester Rasmussen. 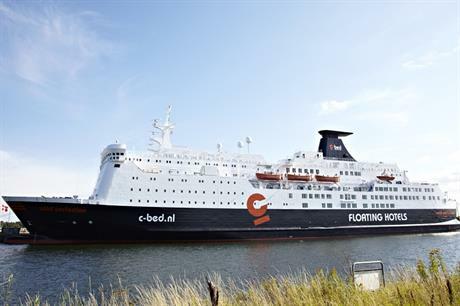 C-Bed is keen to emphasise that its floating hotels are not just for accommodating workers, but also offer space for equipment and spare parts. Converted ferries feature a lower car deck with ample room for the storage of spare parts. Siemens took full advantage of Wind Ambition’s storage space, which its technicians needed regularly during construction of London Array phase 1. Once again, this makes sense; it takes far less time to fetch a part from an accommodation vessel than from an onshore storage depot. Visiting Wind Ambition as its service period of more than a year at London Array draws to a close, the logic of using former ferries to house offshore wind workers becomes obvious. Hotel manager, Jelena Bondareva, has come to know some of the technicians well, having previously served on C-Bed’s first ship, Wind Solution, and views them as part of a big family. Bondareva’s team makes sure that equipment in the ship’s popular gym is working properly and that new films are added once a month to the list available for viewing in the onboard cinema. Cabins feature televisions and there are several big screens in communal areas for sports and games enthusiasts. As in any onshore hotel, cabins are cleaned daily, plus there is a free laundry service for all guests. Internet access is also provided, although it is clear that demand sometimes outstrips supply and C-Bed is responding with plans to increase web bandwidth further. It would be wrong, though, to conclude that C-Bed’s vessels are simply places for workers to relax, as the ships are also places of work for project management staff and a range of subcontractors. During construction of London Array, Siemens’ subcontractor, Specialist Marine Consultants, had its own office on board, dedicated to coordinating the movement of all CTVs working for Siemens. Similarly, Siemens maintained a permanent office onboard and even UK regulator, the Health and Safety Executive, had a couple of desks for its staff. Why locate project management and other key staff onshore when they can be much closer to where the action is? Looking to the future, C-Bed’s Rasmussen is proud that the company’s vessels will soon offer offshore bunkering, allowing CTVs to fuel up without having to return to shore. This should allow CTVs to work in the field for much longer, reducing costly mileage even further. Other innovations, such as installation of helicopter landing pads, are also being explored. While C-Bed has no immediate plans to add a fourth vessel, the three existing ships are fully booked this year and for much of 2014. Whether other providers of accommodation vessels, such as P&O or Comfort at Sea, win contracts in the near future remains to be seen. Vessels operated by Comfort at Sea were used by Siemens at Walney II, in the Irish Sea, and at London Array. Further demand for accommodation vessels for offshore wind projects looks guaranteed, although the market is never likely to involve huge numbers of workers, as is the case within the offshore oil and gas market and its use of residential platforms. Rasmussen envisages accommodation vessels being chartered for operations and maintenance jobs. It is also possible to foresee a time when cost-conscious developers seek to coordinate foundation and cable installation teams much more closely. If this happens, accommodation vessels might be used earlier in the construction phase ­— in advance of turbine installation. These vessels are very much part of today’s offshore wind industry: places where technicians can sleep, relax, work out and get on with office-based work.